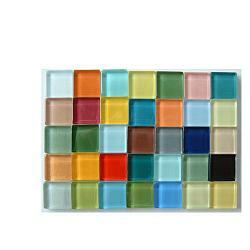 A MIX OF ALL OF OUR REGULAR COLORFUSION CRYSTAL TILES. AVAILABLE IN 3/8", 3/4" AND 1" SIZES. 3/8" - 450 TILES PER LB. 3/4" - 117 TILES PER LB. 1" - 70 TILES PER LB.